This year the IEEE carried out the annual ICC conference in Kyoto, Japan. As usual, this greatest infocomm conference is accompanied by a couple of technical and organizational meetings, held by the IEEE or IEEE Comsoc. 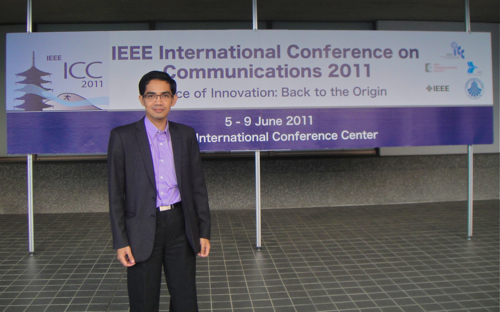 Representing the IEEE Comsoc Indonesia Chapter, I had to be present in Comsoc AP-RCCC. I got the invitation on April, so I had enough time to renew my passport, prepared the visa, airline tickets, hotels, etc. 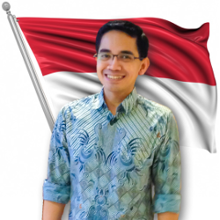 However, these are also the busiest month here at Multimedia Division of Telkom. I could not find enough spare time to relearn hiragana, katakana, kanji, and basic Japanese expressions, or to prepare the social visits. I got the most affordable airline. It took me from Jakarta to Tokyo via Kualalumpur, and landed at Haneda Airport around midnight. 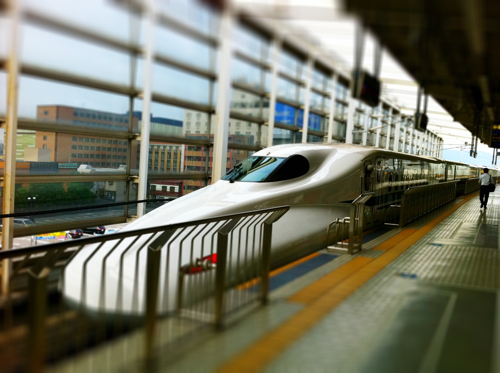 I took the first Shinkanzen super-express train from Shinagawa to Kyoto. I reached Kyoto on June 8th at 9 o’clock. 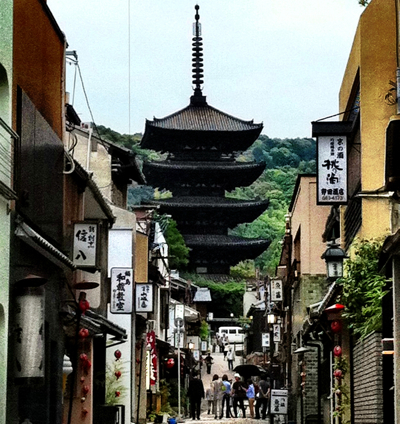 After reporting my attendance to the organiser, I took a couple hours to explore Kyoto. ICC and the other meetings were held at KICC, a quite vast resort in north-east end of Kyoto. Apparently this place is well prepared to carried out international scale conferences and summits. I did not attend any ICC sessions more than some workshop sessions. But the AP-RCCC I attended was held in the same place. Last March we had conducted the IEEE Region 10 Meeting in Yogyakarta, which was the highest annual organizational meeting of the IEEE in the Asia Pacific region. IEEE Comsoc AP-RCCC is the annual organizational conference of the IEEE Communications Society in the region. 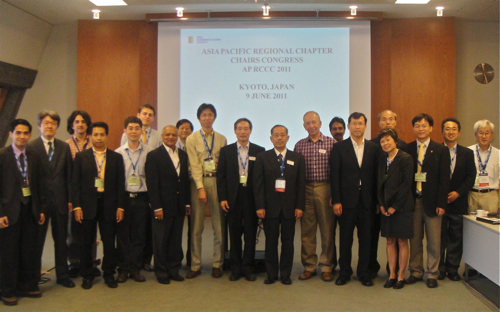 Focusing on the issues in Asia Pacific region, the meeting was attended by President of the IEEE Communications Society, the VPs and directors, a representative of both North America and South America, and the chairmen or other representatives of the Asia-Pacific Comsoc chapters. Comsoc President, Byeong Gi Lee, keynoted by describing the current challenges in the field of communications field. The convergence has been passing some stages in the digital information, and now we are in the middle of the convergence of digital services and management. The convergence is not just among the fields of communications and computing, but extends also to consumer electronics, media, and other areas. Comsoc has anticipated this with various approaches: educational approach and content, industrial approach, and the standardization approach. This is also trailed by restructuring the organization of IEEE Comsoc. Various aspects relating to further convergence has sparked fairly interesting discussions. Then, some VPs and directors presented some reports and guidances. And each chapters presented their reports, plan activities, and other things. The first chapter to deliver the report is Indonesia. From Indonesia, I delivered a report, exploring the chapter’s activities that are still focused on technical and organizational campaigns, including our supports in the formation of the first four IEEE student branches in Indonesia, serial roadshows, and other approaches. Our plan ahead includes the preparation of a larger conference (more than the current form of thematic seminars or lecturing). However, it would require assistance and support from the Region 10 and neighbouring chapters. Also presented are the preparation of TENCON in Bali in November 2011, and our request for distinguished lecturer & distinguished speakers on recent progress in the field of infocomm. Some officers expressed their support for IEEE Comsoc activities in Indonesia. After the conference, I returned to the Kyoto centre by the MRT with Prof. Hsiao-Hwa Chen of IEEE Comsoc Tainan Chapter. I know this gentlemen even before the conference. Last year we made some correspondence to arrange a seminar in Singapore. But in MRT, he showed his other side: an avid culture observer. After talking about chapter management and infocom platform management, we spent the time to talk about the history of Japan, Kyoto, etc. 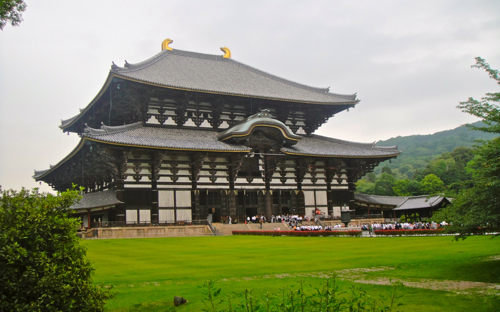 He suggested me to spend more days to explore Japanese cities and cultural centres. So the next day I spent my time to pay a visit to historic areas: Nara (the first capital of Japan as an emerging imperial), Kyoto (the capital of Japanese Imperial for 1000 years), before finally returned to Tokyo (the capital of Japan since the Meiji Restoration). In Kyoto, I got the opportunity to visit the Imperial Palace for about 1 hour. An excellent palace, I must admit. Also I visited Tokugawa shogunate palace. I know I should now spend more time to report my cultural journeys. Indeed I have written them in my travelling blog, koen.cc, but only in Indonesian. I guess I will someday translate them and put them here. Hey there! I just wanted to stop by and say I love to read your site! Thank you. And mind to share your blog address, if any?